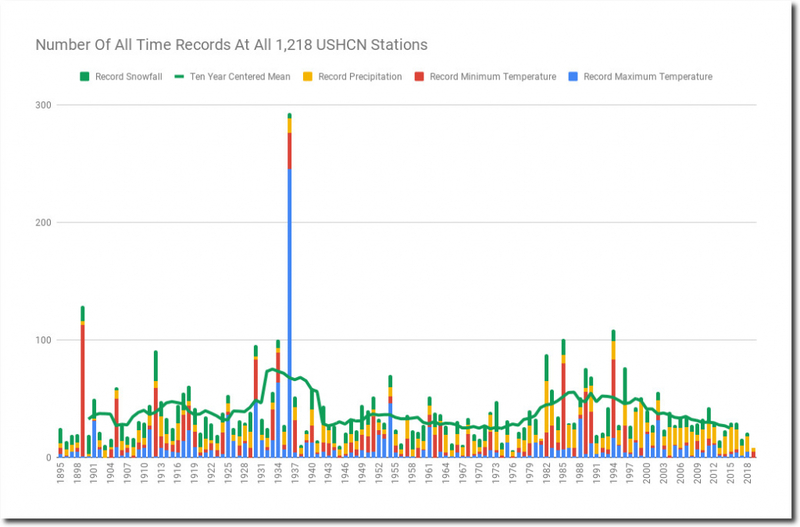 Record weather events peaked in the US in the 1930s, and then there was another peak around the time when Hansen gave his 1988 testimony to Congress, but there has been no long-term trend. 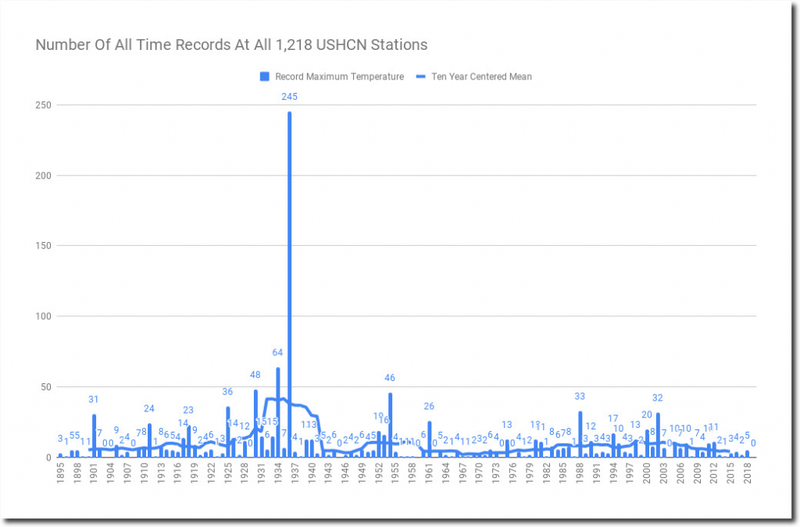 Record cold had several peaks, most recently the 1980s and 1990s. Rainfall records have increased, with the peak year being 1982. Snowfall records don’t show much of a trend, with the peak year being 1996. About the 245 all time records set in 1936 – should we interpret this figure as records that were set in 1936 – many of which may have been broken since 1936 or 245 all-time records that still stand today? I’ve always wondered this. All-time records from 1895 to the present. I interpret “all-time record” to mean as of 2019. 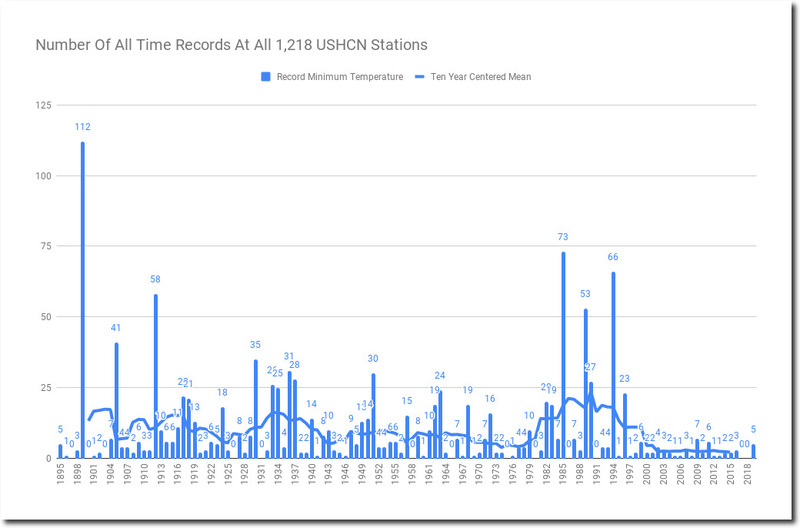 So the 245 record temperatures from 1936 have not been broken yet and still stand. Suppose a new all time record is set at a station in 1950. That counts (obviously) as a record set in 1950. 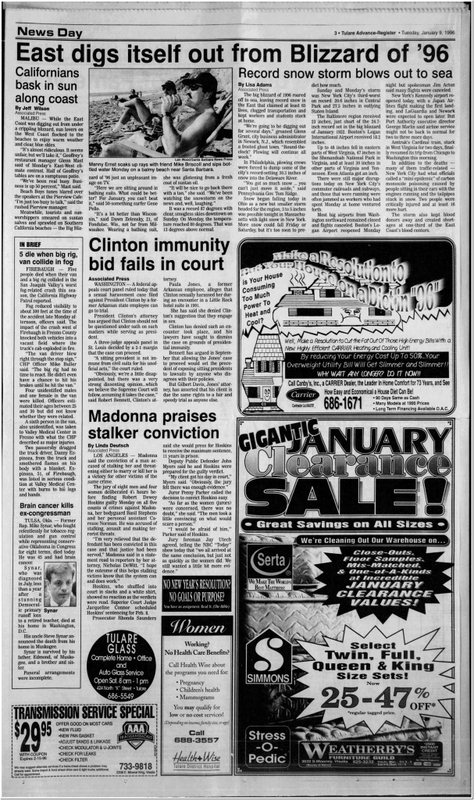 Suppose that temperature is matched but not exceeded in 1990. 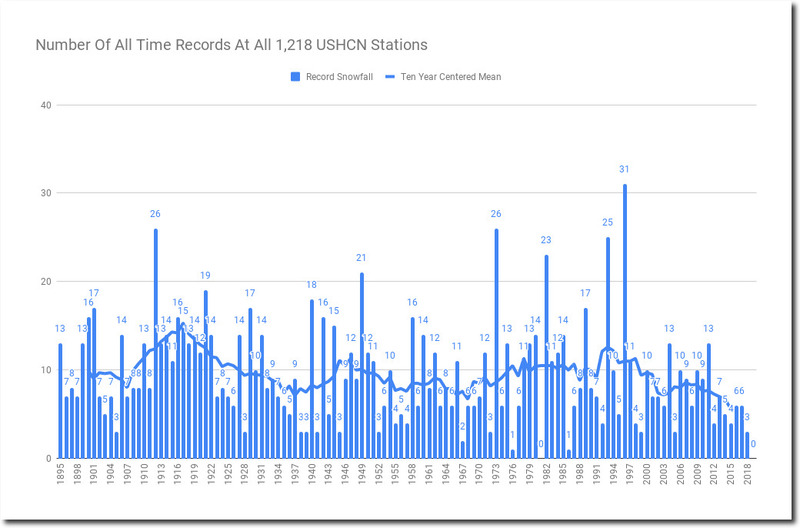 Then both years, 1950 and 1990 get counted as having set a record. 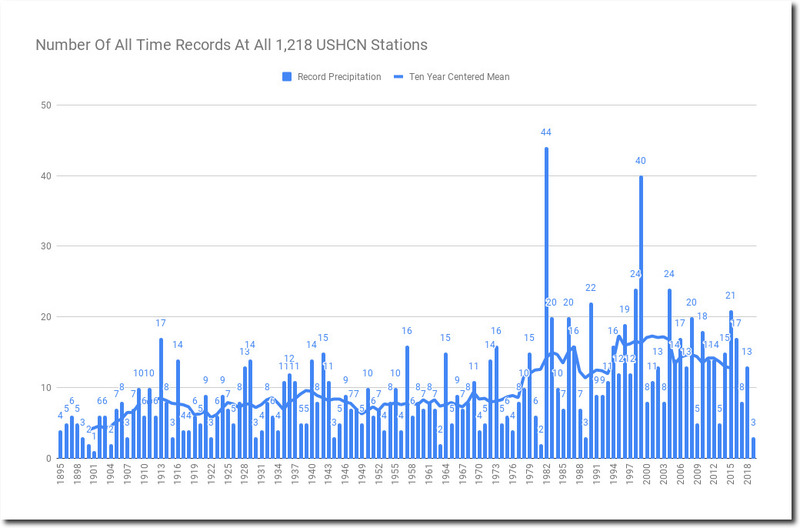 Suppose that in 2010, the same location breaks the 1950 and 1990 record. In that case the 1950 and 1990 records are removed from the record count, and 2010 is given the new record. The only reason why I post this comment is that a lot of CAGW proponents have complained that “of course the older years show more heat records. They are newer stations with shorter histories back then and any hot summer would be a new record!” Counting ties and removing broken records fixes that complaint. Weather is most likely going to get very extreme for some folks this weekend and next week. Probability of an outbreak down south across LA to AL and then up to the Ohio Valley this weekend and then the set up for next week is nearly identical to the one that caused the super outbreak in 2011. Would not be surprised if we see an EF-5 before the end of next week. Lets hope it doesn’t hit anyone unlike the one in 2011 when Joplin, MO got hit head on by a monster EF-5. rah: According to top climate scientists, we are sigma 5 certain that the extreme weather coming this weekend is man-caused, um… mostly. There is a natural component, but we’re only sigma 3 certain that natural factors … uhm… have a calming effect, yeah that’s it, the opposite of the man-caused extreme weather. We know this, and it’s very scientific because the models show man-caused extreme weather should be more extreme, so obviously nature is, uh, less extreme. Mind you, that natural less-extreming effect may not last, in fact we’re kinda uncertain about that whole part. But that makes the man-caused extreming part even scarier when you think about it. Any chance you can give up fossil fuels before the weekend? Hey paul! Ha! I remember seeing some CAGW guy saying something to the effect that “120% of the current warming is caused by manmade CO2!” In other words, if it weren’t for a moderating natural effect, the heat would be even worse. Of course, such a statement is completely delusional. With a hundred conflicting models and predictions, people pick whichever they wish which will match their desires and viola! About as much chance as giving up my guns, a choice or prime medium rare steak, Jack & Coke, and the 2015 Freightliner I drive for a living! That is an amazing set of charts. Extreme tornadoes as far as I know follow a similar pattern – any chance you might add that category? 2018 was the first year on record with zero US tornadoes of EF4 or EF5 strength. Unsure about the one that struck in Alabama recently, but a friend down there says he heard it was an EF3. Detroit river has thin ice and some open water. Been passing over the Ambassador bridge checking it out frequently. Doesn’t look likely that Michigan and Ontario are going to make it to 50% this year. EF-4 is what I heard reported. 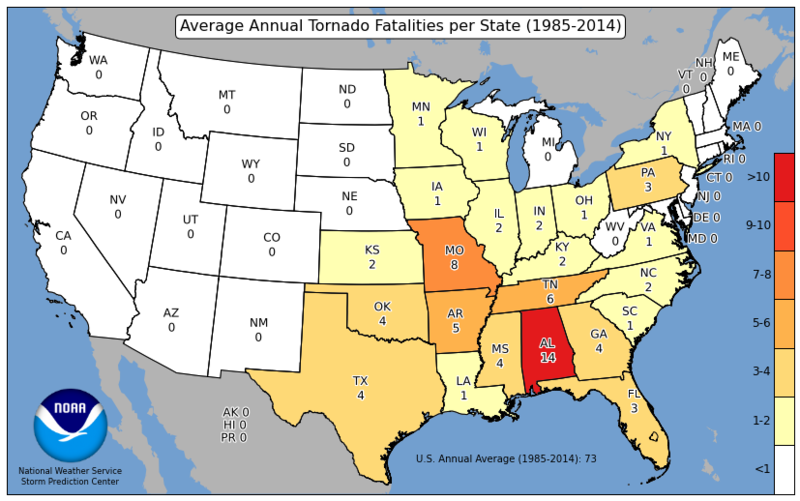 BTW historically, Alabama suffers more tornado fatalities relative to the number of reported tornadoes than any other state. And I usually think of tornadoes as being in Kansas or Oklahoma….. I reckon the reason for this is higher population density and more woods and hills. Out west one is more likely to see what’s coming. And although I have no science or stats to confirm it, my impression is that tornado outbreaks in the SE hit in darkness more frequently than they do out west for some reason. I noticed from the helicopter footage of the damage path that killer in Alabama hit a lot of what had been modular homes. No basements, nowhere to go. But it should be mentioned that the record is harder and harder to beat as the number increases-if there is no trend. The upper Midwest has seen its share of records this winter. Many record low min and low max temps broken. Many stations (like Duluth, Minneapolis, Grand Forks, etc) reported Feb has having their snowiest month on record. Currently Duluth is looking to have a 3rd place record for the number of days in a row below 32F. After today it will be 59 days, which will tie with 3 other years. If tomorrow stays below, which it might (very close in the forecast), then 60 will be a sole 3rd place, but far behind the 70+ back in 1979 and 1875. With such a cold Fall, and most of Winter being terrible (except Dec, that was a mild month) I’m SO READY for Spring. But I don’t think the next 6 weeks are going to be all that great around here either. 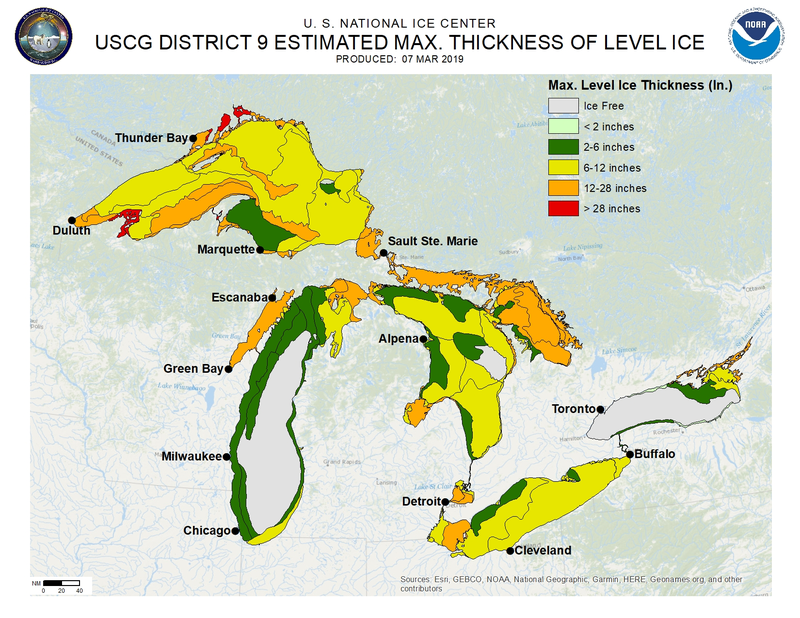 With Lake Superior over 90% in ice coverage, most of which is fairly thick ice, shipping season will have a rough start later this month. Probably will be delayed, and will probably be in need of much more CG cutter help than normal.